More Fijians say political parties should keep all their campaigns and pocket meetings open to the news media. 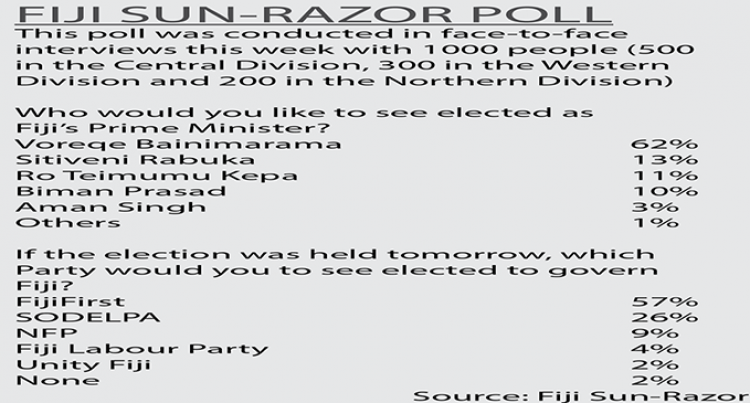 In the latest Fiji Sun/Razor weekly poll, respondents were asked whether political parties should keep all their meetings open to media. Sixty per cent said Yes while 21 per cent said No. Nineteen per cent were unsure. Fiji Sun’s journalist Ashna Kumar was barred from covering a late night National Federation Party meeting in Vuci Road, Nausori recently. A majority of Fijians feel that this should not have happened. SODELPA, to its credit, has not stopped any media from their campaign meetings. Unity Fiji has been holding meetings without any advance notice while FijiFirst is yet to start their campaigning. Meanwhile, Prime Minister and leader of FijiFirst, Voreqe Bainimarama still commands a strong lead as the preferred Prime Minister. He maintains his commanding lead at 62 per cent of votes. Trailing him in second place is SODELPA leader Sitiveni Rabuka at 13 per cent. Opposition leader Ro Teimumu Kepa is close behind Mr Rabuka with 11 per cent. The gap underscores the tense rivalry between the two camps with Mr Rabuka doing all he can to increase his lead. National Federation Party’s popularity rose slightly. Both the party and its Leader Biman Prasad gained from the big media coverage of their annual general meeting in Ba last weekend. A bigger jump was expected but the controversy surrounding alleged anti-Muslim remarks by its provisional candidate Pradeep Chandra may still be casting dark clouds over the party. In the overall standing, FijiFirst still maintains a strong lead but has seen a dip in its approval ratings. The party polled 57 per cent, a drop from 67. SODELPA has recorded an opposite effect. While Mr Rabuka has not improved in the poll SODELPA as a party has seen the increase by a jump to 26 points. Could this be linked to the wide circulation of a DVD produced by the SODELPA camp to promote its leader and to discredit Mr Bainimarama and its general secretary Attorney-General Aiyaz Sayed-Khaiyum? NFP’s approval rating has slightly increased but still not into double digits. Its nine per cent approval rating can largely be attributed to its annual general meeting last Saturday.